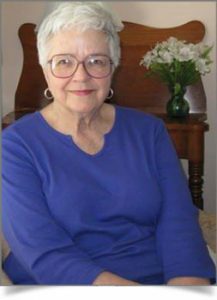 Betsy Tice White has worked in some area of publications all her adult life. She moved on from her start at McGraw-Hill Encyclopedia of Science & Technology to freelance editing (U of VA, U of Miami, U of NC, and John F. Blair, among others) when her children were young, then became the first medical editor at East Carolina University School of Medicine, where she coordinated with UK editors on a multivolume atlas of surgery. A later stint editing a college alumni magazine was followed by a move to Recovery Communications, Inc., specializing in books on addiction and recovery. Her published work includes a book collaboration of Blue Ridge Mountain tales, Le’s Whittle Awhile; two books on teen addiction and family recovery, Smoke Screen and Turning Your Teen Around; and, purely for fun, Mountain Folks, Mountain Foods. Betsy’s latest work is an early 20th-century novel, A Patriotic Man, inspired by the discovery of a cache of letters her young officer father wrote home from France during the Great War. Invited by long-time friend Renni Browne to join The Editorial Department, Betsy edits both fiction and nonfiction, with special expertise in the areas of medicine and addiction/recovery. Favorite nonfiction genres include memoirs, biography, and autobiography, while in fiction she particularly enjoys work on mysteries, police procedurals, suspense, and thrillers, and has completed ghostwriting assignments as well. A Tennessee native, Betsy says she was “vaccinated” with printer’s ink early, through her father’s position at Kingsport Press, then the world’s largest book manufacturer. An ardent Anglophile, for recreational reading she seeks out books by UK authors, along with favorite southern writers James Lee Burke, Lee Smith, Silas House, and Dorothea Benton Frank. She and her physician husband live in a suburb of Atlanta and enjoy the nearby mountains when they can get away.